A couple of days ago Google released Google My Maps, (formerly Maps Engine Lite) which is Google’s tool for creating custom maps. 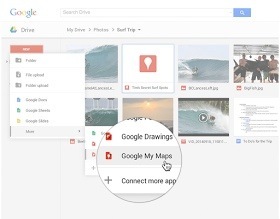 Google Maps is now integrated with Google Drive. You can access My Maps right from your Drive account using the same menu you use to access your Docs, Slides and Spreadsheets. To create a custom map on Google Drive, click on “New” then “More” and select “My Google Maps”.